Secondly - ZOMBIE FAIRY! Yes, finally, after a long time in the works we have a Zombie Fairy available for pre-order as a statue from Hamilton Collection. It's only up on the USA site so far, so US customers can pre-order online here (outside the US? Don't worry, she'll be available worldwide soon, I'll keep you posted). Thirdly - DisneyStore.com now has a TON of my Disney artwork & merchandise, and they will ship worldwide! Details are below in this update - or for a quick peek click here or click here if you are on a mobile device. (Please note, you will need to access the FULL version, non-mobile version of the site if you want to ship overseas). Finally, all over the world you can order many of my Disney items previously only available at the themeparks. In Patreon news - I have announced my next giveaway! 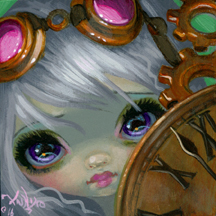 A new steampunk-themedoriginal painting on January 15th a winner will be announced! Giveaways are through my Patreon here - As long as you are signed up (subscriptions start at literally $1) you will automatically be entered in all of them. My illustration for the 78 Tarot’s “Carnival” deck. I was assigned the “Death” card, and as it’s carnival themed I’ve gone the Venetian masquerade route on this one, and I love it! I’ve given her a dark red dress (it kind of has a Masque of the Red Death feel to it). The background has an Italianate feel. The skeleton guy on the horse skeleton is based on a very old anatomy etching I came across. As it needed to encompass the Tarot Death card themes as well as the Carnival theme, there are small dancing masked figures or skeletons circling around her, and death on his skeletal horse in the distance. My Plague Doctor / Alchemist character (he appears in a lot of my works) is looming behind her. 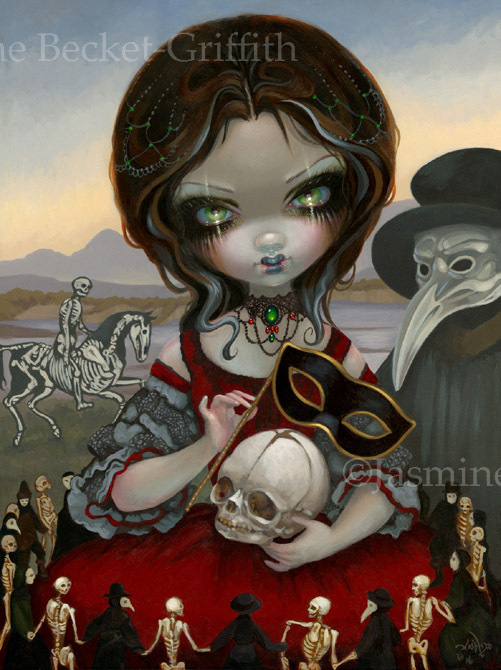 Love this piece – stay tuned for the Carnival deck from the team at 78 Tarot – it’s going to be wonderful! My own acrylic painting, the original has sold but we have prints & canvases available. We have glossy paper prints, signed on the back by me, on sale this week - $9.99 for 8x10" and $19.99 for 12x16". We also have TWO types of canvas prints - the open edition 12x16" canvases are also on SALE this week for only $90 (wow! ), and the HUGE 18x24" Masterpiece Limited Edition Canvases (hand embellished by me, siged & numbered - an edition of only FIVE ever made) for $595. All types of prints & canvases are up at Strangeling.com here, just use the drop-down menu to choose what type/size of print you'd like. These figurines have been in the works for quite awhile (those of you on Patreon have seen some of the behind-the-scenes process) and now are finally up for sale to the public! Yes, as always with Hamilton Collection, they first pop up only on the USA website (not Canada, not other countries, they won't show up there yet). US Customers can order starting TODAY here. The rest of the world will follow shortly! 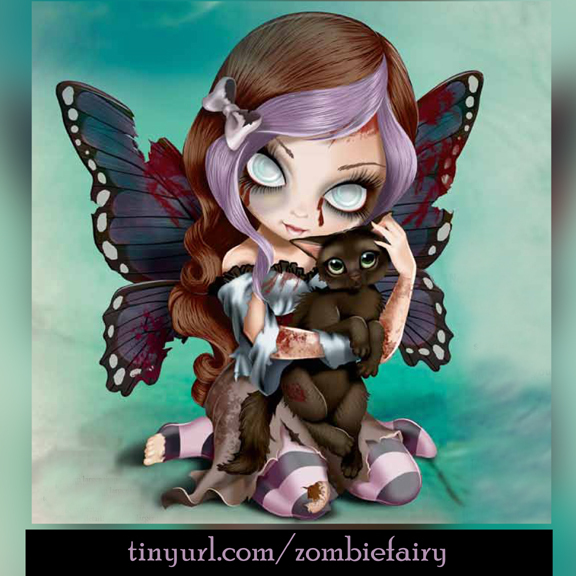 Licensed by the Bradford Group ©Jasmine Becket-Griffith - "Zoe" is the first fairy zombie in the collection (which is called "The Flying Dead" - ha) being created & sold by the Hamilton Collection. Questions, suggestions, inquiries about previous orders, new orders, shipping, payment, etc. all needs to be directed to the Hamilton Collection - 1-877-268-6638 or at their website link above. Limited Edition, cast in artist resin, first figurine is Zoe, shown here with her cute black kitty! Each additional figurine is $39.99. 4" each high, absolutely adorable! You either subscribe to the complete collection or buy Zoe individually at the Hamilton website. And again, international customers - you'll just have to wait a short while, I'll let everybody know when she is available on international shipping websites. LOTS of my stuff is now online, shipping worldwide! Awesome news! DisneyStore online now has a TON of my Disney stuff here - all can be shipped WORLDWIDE. Usually these items can only be found inside the Disney themeparks & galleries, so this is a wonderful opportunity to purchase these from the comfort of your own home, wherever in the world you live. 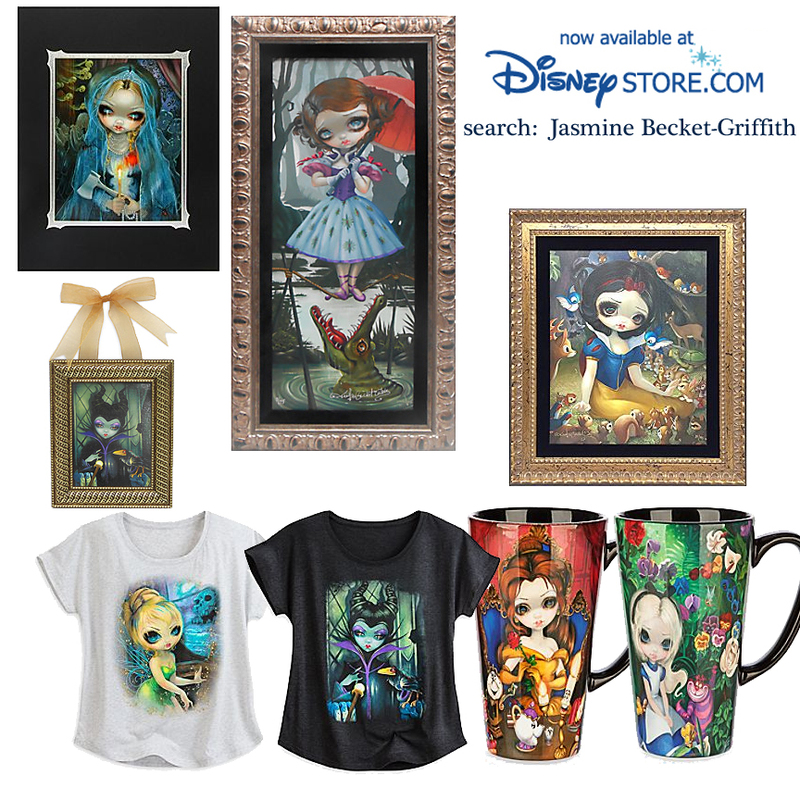 Use the link above or just search Jasmine Becket-Griffith at the DisneyStore.com website. Live outside the US? That's okay, they will still ship to you! Please note - DisneyStore.com has a lot of flashy software that doesn't work seamlessly on some mobile devices. The mobile version of the website may not offer all of the shipping locations, so if you are on a phone/mobile you will need to either click the "Full Site" option instead of Mobile (probably at the bottom of the page) or else you may need to just hop onto a regular computer. If you are having any technical difficulties (the different countries should appear as a dropdown box, all countries in alphabetical order on the Delivery page of checkout) - email guest.services@disneystore.com and a tech can walk you through your order. Again, they ship WORLDWIDE and have many shipping options, for all the details and timelines and shipping types please refer to the Disney Store's shipping info page here . Again - UK/Canada/AU/EU and beyond can all place orders here. These of course are also available at the Disney themeparks & WonderGround Gallery too, but this is the first time they've been for sale from Disney online. Alternately too, if you find your phone or browser isn't finding the items, you can go to DisneyStore.com and just browse through the "NEW" section (click where it says "New" for the New Arrivals section at the top of the page) and scroll through. There are about 9 pages in all, my products & artwork are sprinkled throughout. All my Patreon patrons are entered automatically. Join HERE. I'm giving away a new ORIGINAL PAINTING on Patreon here - worldwide, international patrons are welcome! One Patreon supporter will be selected randomly Friday night, January 15th at 8pm EST. It is open to all levels of Patreon subscribers, worldwide, even just the $1 level. All you need to do to enter is to be signed up at my Patreon by 8pm. Every week or two I do giveaways, figurine giveaways, coloring books, prints, rare items, and once per month an original painting. Only Patreon supporters will be included in the giveaway. If you are not yet a member, just click this link and hit the"Become a Patron" to sign up, from only $1/month to subscribe and you always get entered in all the giveaways =) There are other great rewards at other tiers too, advance previews of paintings & shows, first looks at works-in-progress, discounts, pre-order opportunities for limited editions & more. My beautiful "Smile" painting is now available as Limited Edition Canvas prints (original painting has been sold). The #01/25 first canvas in the edition (all are hand embellished by me, signed and numbered out of 25, wrapped on boards & ready-to-hang) is currently up for auction on eBay here to give everybody a chance, since so many folks specifically want the #1 edition. The other canvases in the limited edition are now up at my website ($100 each) as well as the paper prints (only $13.99) - you can see & purchase both options here.